Texas Democrat Kesha Rogers: Fear of a LaRouche Planet. 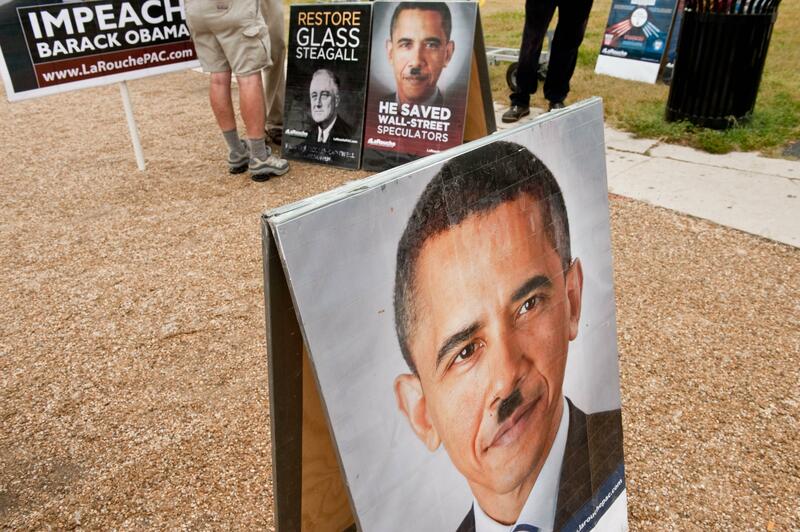 A picture of President Obama with a Hitler mustache is displayed by supporters of Lyndon LaRouche during a Tea Party march in Washington, D.C., on Sept. 12, 2010. This is just the image Democrats want to convey to the world! Last week I noticed that the only full-scale poll of Texas’ primary elections—which are happening today—contained good news for Lyndon LaRouche. Kesha Rogers, a perennial candidate who has won two Democratic nominations for Congress in a safe Republican seat, was leading the primary for the party’s U.S. Senate nomination. If she won it, she’d face Sen. John Cornyn and share a ballot line with Wendy Davis. The Democratic Party of Texas would have, as a standard-bearer for federal office, a woman running on an “impeach Obama” and “oppose the British empire” platform; a woman whose supporters show up to basically any political rally in driving distance with signs that portray the president as Adolf Hitler. Democrats would prefer to stop this. David Alameel, the dentist and philanthropist endorsed by Wendy Davis, is spending $3 million to win the primary and his campaign calls the poll “nonsense.” Maxey Scherr, an attorney, has raised $300,000 and stands some chance of passing Rogers. Did any of you idiots who are trashing Kesha Rogers and Texas voters consider that maybe voters in Texas oppose Obama’s Wall Street-directed policies, such as more bailouts for Wall Street, a law which forces Americans to buy PRIVATE insurance, defense of Bushite NSA spying, drone attacks and GITMO, and committing the U.S. to regime change? Do you all believe the line that Obama wants to do what’s right, but is held back by mean Republicans, such as FOX TV and the Tea Party? What cowards!! A real, fighting Democrat, in the FDR tradition – and there are still some of those left in Texas – hates the corporate agenda of today’s Wall Street Dems (ever hear of Ralph Yarborough, Jim Wright, Henry B. Gonzalez?). The disaster for the Dems in Texas is when they defend the indefensible, namely the Obama regime. And so on, and you have to wonder who these people think they’re convincing. OK, true—Kesha Rogers’ strategy of running for something every two years has led to voters sometimes nominating her. In 2012 she won a nomination with more than—wait for it—3,000 votes. That’s enough to fill a decent-size concert venue in a midsize city! Texas is a pretty big state, though, and most of its Democrats will win nominations today without calling for the impeachment of Barack Obama. You might reasonably conclude that “impeach Obama” is a fringe position in the party, and that voters don’t know who Kesha Rogers is. They’re showing up to vote for a massive number of offices—sheriffs, judges, state reps, mayors, city councilmen. They don’t want to leave the ballot blank at the top. “Kesha Rogers”—sounds like a normal enough name. This has always been the strategy of LaRouche cultists and other fringe candidates. Some fringers, like South Carolina’s Alvin Greene*, seem unaware that it’s a strategy. Greene, like Rogers, was an African-American running in a state where the once-dominant Democratic Party has bled most of its white support. Rogers, too, can probably count on some of the black electorate (it could make up 20 percent of the primary vote) recognizing hers as an African-American name, and going for her, unaware that she wants to impeach a president they actually, actively support. It’s all pretty humbling if you like to believe that voters pay close attention to elections. *In 2010, Republicans mocked Democratic gubernatorial candidate Vince Sheheen by calling his ticket “the Greene-Sheheen machine.” Sheheen lost narrowly to now-Gov. Nikki Haley.